When you book your charter, make sure you select a destination that gives you something to remember. New York is the best location you can find if you’re looking for relaxation, city life, and incredible views. Make sure you select a boat that will accommodate your entire group. Here at Nautical we have an abundance of options for small intimate parties to charters for hundreds of guests to check out our fleet click here. What kind of event are you having? A brunch cruise? A wedding? Make sure you schedule enough time for departure and arrival. Nautical has several flexible options that will ensure that you have all the time you need. Keep in mind the accommodations each yacht has, some come with WiFi, a top deck, dining halls, and plenty more. Explore our yacht options here to see all of the fun features your charter can include. If you’re hosting a New York Charter event you’ll want to make sure your guests have the best food available. Nautical Holidays has top-notch chefs that can prepare an array of dining options from buffet to gourmet meals. We have professional planners on staff to help create the perfect event for you and your guests. Give us a call, after years of expertise and experience, we are happy to answer any questions you have. To book your New York Yacht Charter, contact us here. Need a beautiful yacht for your next large wedding or corporate event? 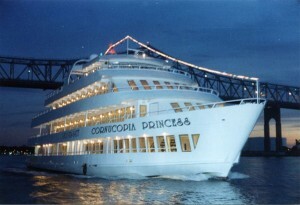 The 130-foot Cornucopia Princess is perfect for groups of up to 400 people! She has four festive decks and inviting dance floors along with airy and atrium-style dining room. This ship offers something for everyone and every event. Events like anniversary dinners, award lunches, and graduation dinners—which each call for a gourmet meal—can easily be accommodated on board the Cornucopia Princess. A delightful menu of American food selections is arranged fresh every day by top-rated chefs. In fact, couples who are in the mood for a remarkable meal may wish to book the yacht for a dinner cruise for two, rather than going to a restaurant. Afterward, guests can take in fabulous scenery and views of the New York City skyline, including a sunset all from the observation deck. Directors who need to schedule film shoots of the Big Apple are also welcome to charter the Cornucopia Princess to help them get the perfect shots they need for their movie or television show. For more infomation contact Nautical Holidays here or call 203-637-0279. 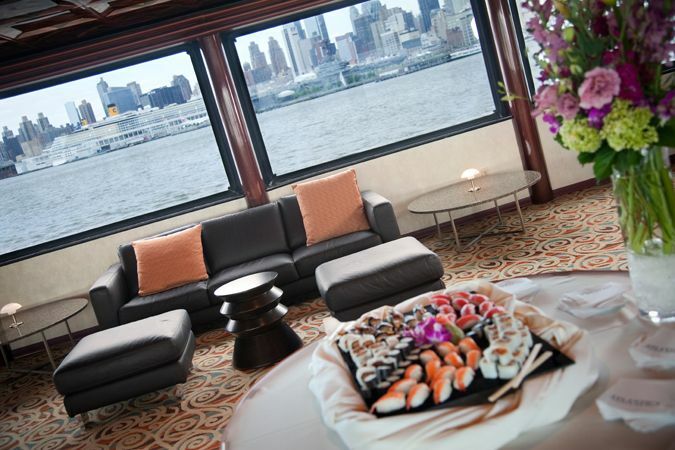 Charter a Luxury Yacht for Your Next New York Event! 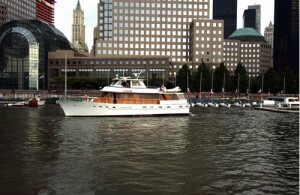 A yacht charter in New York is an impressive gesture. Whether you are having a corporate event, wedding, anniversary or a party for friends, we can provide the ultimate in New York yacht chartering services. We will customize your event to be uniquely yours, no cookie-cutter events. We have in-house event planners that can help you create the customized event of your dreams that can work with events with groups ranging from 2 to 600. Whether you are a NY native or a first time visitor, seeing it from a luxury yacht is a truly unique way to see the sights and enjoy this incredible city. Sailing up the East River around the Williamsburg Bridge gives an excellent view of the Statue of Liberty beneath the Brooklyn and Manhattan Bridge. 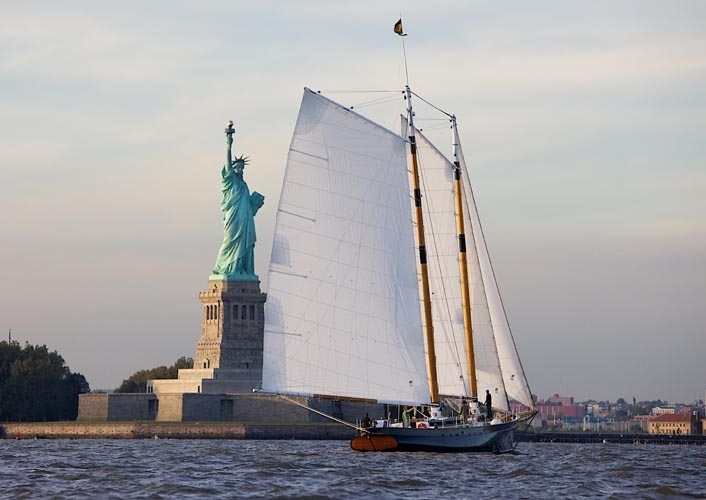 The yachting season in the New York area runs from around May through to October. Summer winds are usually reliable and consistent; however, some days can be foggy. 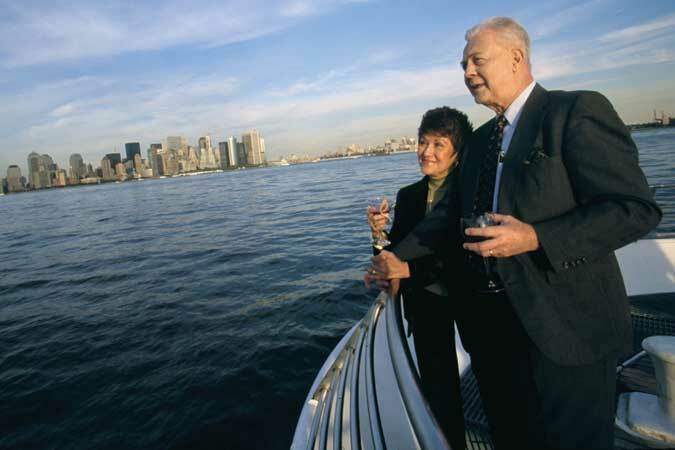 Cruising in the metropolitan area of New York, Connecticut, New Jersey and Long Island Sound provides miles of beautiful coastal sights and entertainment for a charter of any length. 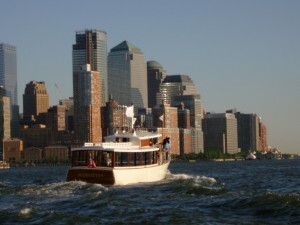 Ever wanted to charter a famous yacht through the beautiful New York City harbors? The Calypso is the perfect yacht for you. This ship is no stranger to the limelight. Featured as a fabulous prize on NBC’s reality show, The Apprentice with Donald Trump, it has also been chartered by cast members of the Sopranos, Will Smith, MB2 and Donna Karen. Experience luxury as your guests enjoy cocktails on the main deck of the Calypso that has luxurious fabrics and leather with a tasteful Hemmingway Motif. This yacht has beautiful French doors and a varnished mahogany and teak after-deck that your guests can unwind in style while they sit back in the deck seats and watch the New York skyline reveal before their eyes. “If you want to show someone all of Manhattan, it’s just fantastic…there’s no better way,” Steve Schirripa said, from the Soprano’s, as quoted in the New York Post. 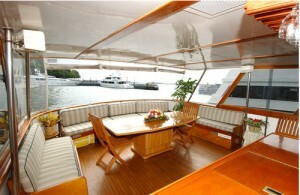 This 72 ft Stevens Motor Yacht can support groups from 20 to 36 guests with cocktails and buffet style food. We can arrange a plated sit down dinner for 12 guests at the dining table which is behind the foremost rooms with access through the double French doors which gives the dinner a magnificent view of the New York skyline. Plan your next event on this world famous yacht by contacting Nautical Holidays here! 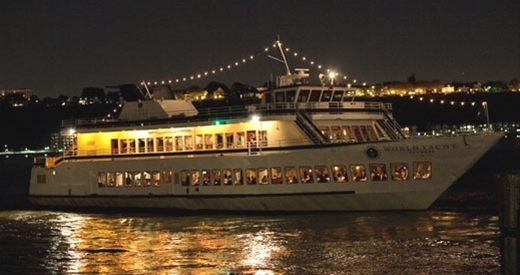 Celebrate Your School’s Prom On A Yacht! Nautical Holidays provides fun and exciting luxury charter yachts for all proms. 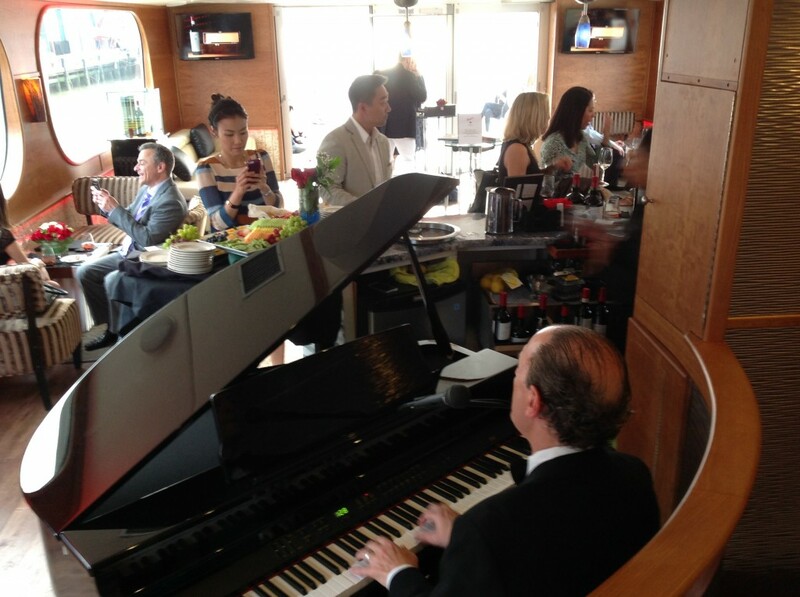 Proms aboard a charter boat immediately become memorable and unique for all guests attending. We can ensure a safe and supervised cruise with full entertainment and cuisine. Have a Prom that everyone will talk about for years to come. We have the knowledge and expertise to make it the perfect prom. Nautical Holiday’s can provide catering and restaurant style options for your Prom celebration. 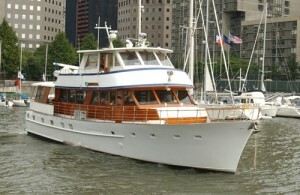 We have luxury charter yachts in the New York harbor available to host your special day. Imagine the sunset, the fresh air, elegant cuisine, and dancing under the stars on your very own luxury yacht surrounded by all of your friends. You and your guests will be the only ones on board having the time of your lives. Whether you want a particular themed or traditional event, our event planners can work with you to make your dreams a reality. Click here to contact us or view our yacht fleet. Graduation Celebration on a NY Yacht! Looking for party venues in New York for your next celebration? Try having it aboard a private luxury yacht! Graduations are a special time in our lives and what better way to celebrate than with everyone you know and love aboard a private yacht. A cruise on the New York Harbor during the beautiful spring months will be the perfect environment to entertain your guests. 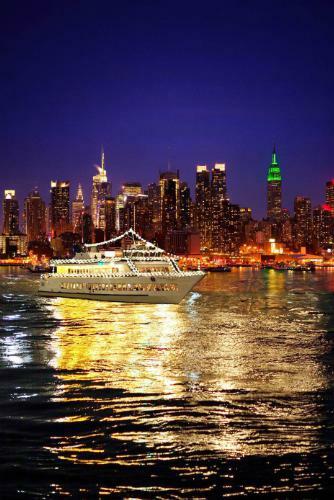 Treat your guests, and yourself, to a casual cruise with food and beverages, while touring the magnificent NY Skyline. It is perfect for out-of-town guests who have never seen Manhattan and its lights in the evening time. Our event planners can help create your vision or plan from scratch! Plus five-star catering options are always available! We are happy to provide recommendations, sample itineraries and sample menus to start the party planning process. So many years of hard work to accomplish your goals should be celebrated by doing something special. Contact us here to learn how we can help with your next event! 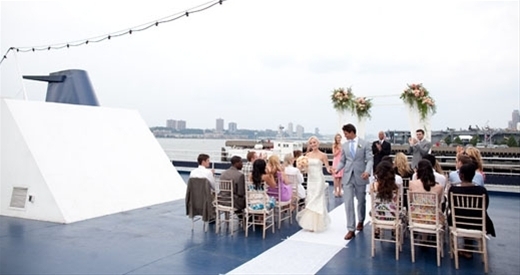 Host your big day aboard a yacht to have the perfect combination of scenic views and classic elegance. Our luxury yachts make the perfect location for a wedding that offers an extraordinary and picturesque setting; highlighting outstanding cuisine, excellent service, and skyline views that are beyond comparison. No other venue can give you 360-degree panoramic views of New York while pampering your guests in style. Whether you are deciding on something elegant or casual, there are a wide variety of yachts available from our fleet that can match any wedding theme. Whether you plan on an intimate setting or an extravagant celebration, we will customize the day to meet your individual needs. We have professionals that will work with you on reserving dates, menu and bar details, reception set-up, floor plan and event composition. The photo opportunities you can create are incredible. Skylines, historic bridges, sunsets, the Statue of Liberty all create a breathtaking and scenic backdrop. Customize a boat life ring with the couple’s name on it for decor that makes a memorable keepsake. Exchange vows and begin your lives together in one of the most unique ways possible aboard a luxurious yacht. Our professionals can help you plan and execute the wedding of your dreams. To learn more about our partial or complete wedding packages click here to fill out an event form or contact 203-637-0270. Get away from the everyday New Years party with a special yachting event. Hosting a private party will ensure you avoid all of the crowds during this time of the year. You will also have the best view of the fireworks at the stroke of midnight. Whether you are looking for a romantic setting or a rocking party, we can help make your event exactly what you imagine it to be. When the ball drops, don’t fret—the majority of our boats have plasma TVs so you can still enjoy the Times Square festivities from the comfort of your chair. Ring in the New Year as you enjoy a five-star meal, premium cocktails, DJ or band, and panoramic views of Manhattan. Please contact us or call 203-637-0270 to help you organize your next seamlessly prepared, and perfectly executed yacht charter! Best Christmas Lights in New York! Let Nautical help you celebrate the Holidays this year aboard your own holiday themed cruise. 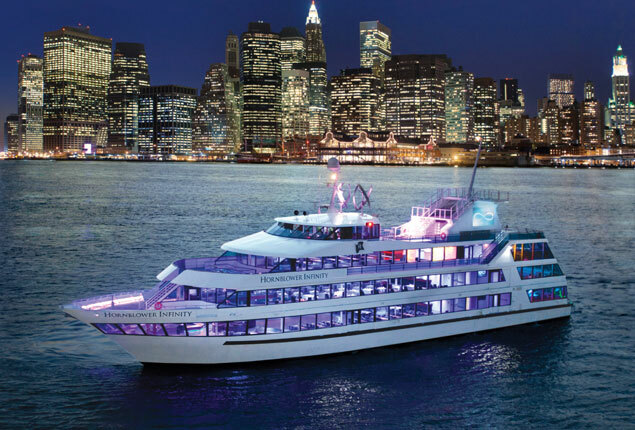 There are plenty of great ways to celebrate the holidays aboard your private yacht in New York. Enjoy holiday tunes, get cozy with a blanket, and create a s’more station to bring your guests into the Spirit of the Season. Our five-star chefs can prepare a full four-course meal, buffet style dinner, or cocktail serving sizes for guests. Working with us means getting what you want without the hassle. There’s no better way to see the city of lights lit up for the holiday season. See the beautiful New York skyline decorated in lights upon lights from the water. We pride ourselves with our event planning expertise and will accommodate your guests with whatever you wish including hot cocoa, eggnog, and cookies. We can decorate the interior and exterior of the ship with Christmas lights and trees or whatever you need to celebrate your holiday. 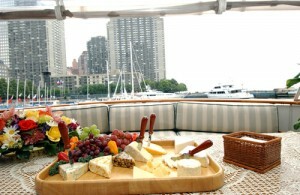 Every charter will be catered for you. To learn more about the great holiday cruises and yacht parties we can help you host, contact us at 203-637-0270.